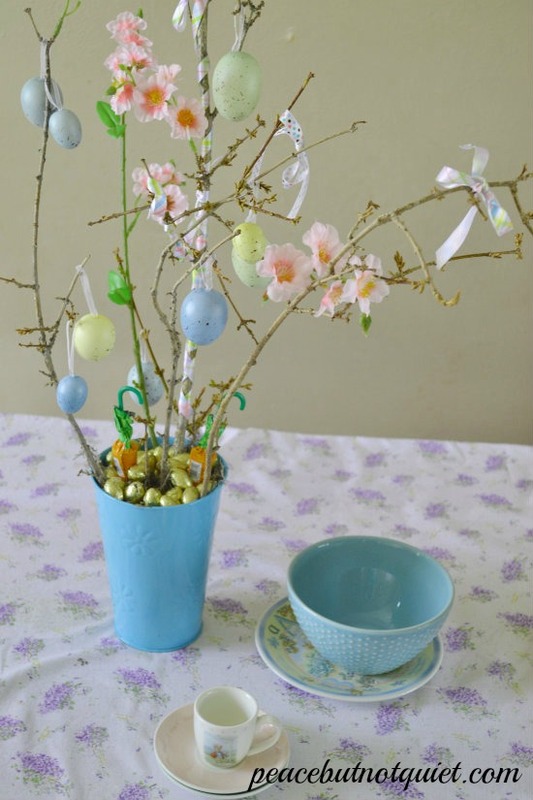 When I was little, my mom and a friend made an Easter tree one year. I’ve always wanted to make one, and I assumed it was — if not a common tradition — at least one people had generally heard of and knew about. 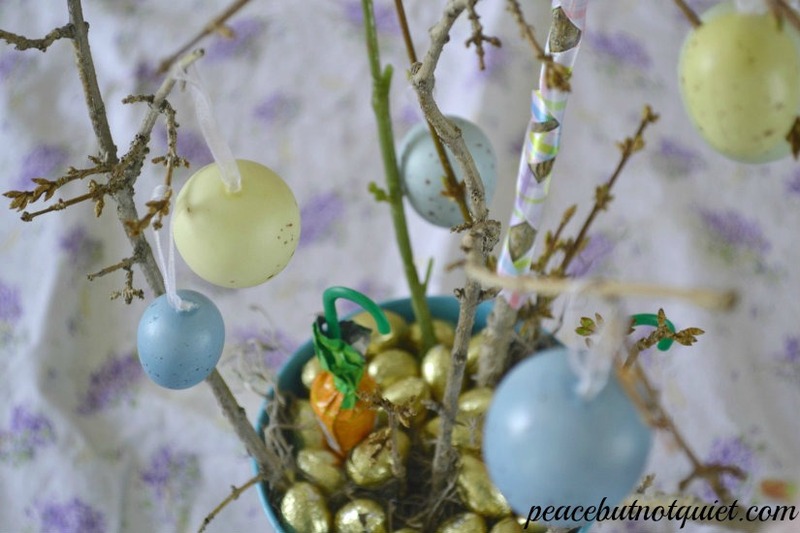 But my husband insists that no — most people here in the U.S. have not heard of Easter trees. I believe they’re more common in Europe, so if you’re from a European country and would like to enlighten us all further, I’d love to hear your thoughts in the comments. 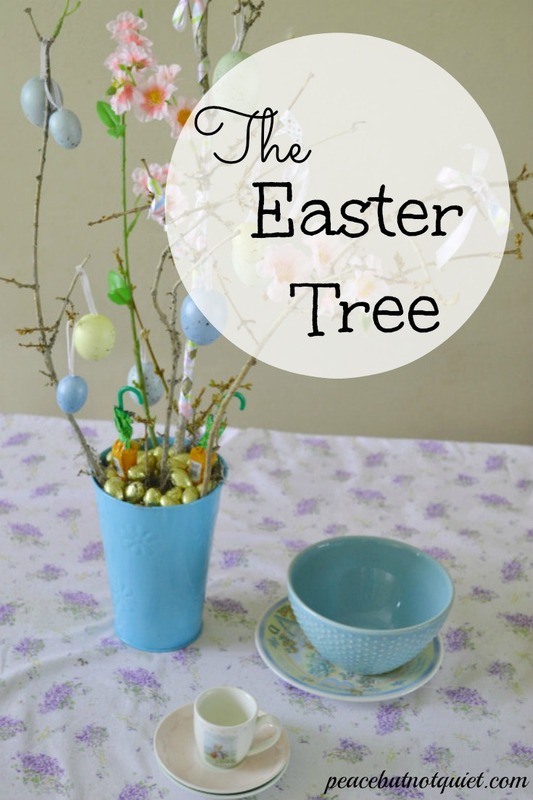 Annnnywhoo, the kids and I decided to create our own Easter tree — and it turned out pretty cute, if I may say so. We began with a few supplies — most of which we already had. Some branches from our forsythia bush. A sprig of fake flowers. A tin bucket with river pebbles to hold the branches in place. Some ribbon. And some plastic eggs. 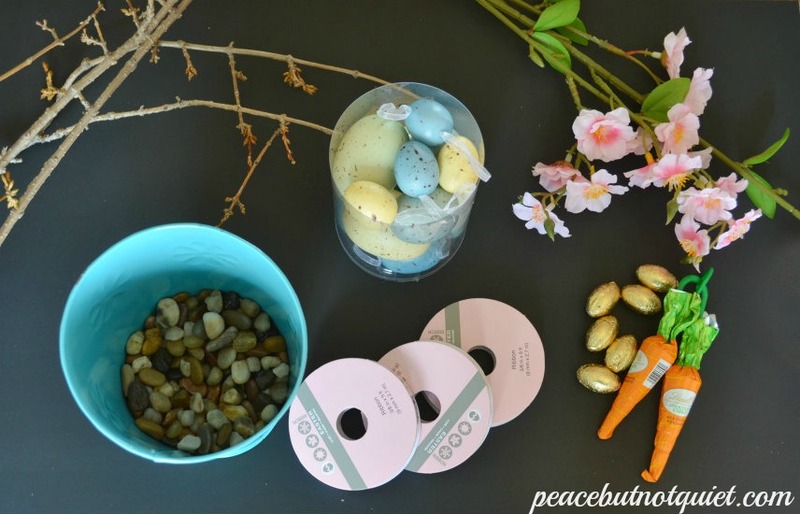 Our eggs came with the ribbons already attached for hanging, but you could easily glue-gun a small loop of ribbon to the tops of some plastic eggs if you can’t find any ready for hanging. We filled our bucket with the river pebbles, and then topped it off with some dried moss leftover from our Pinecone Angels. We arranged the branches and added the fake flowers. And then we got to work decorating. The kids had so. Much. Fun. 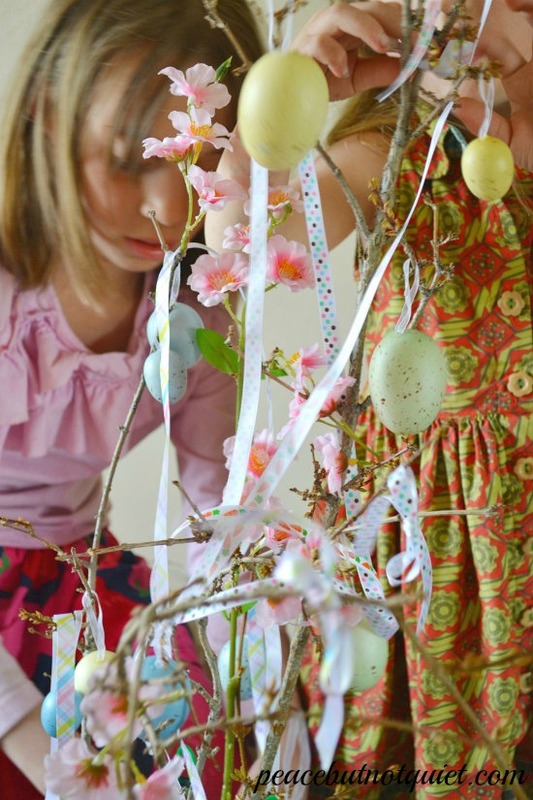 And operating under the belief that if it’s worth doing, it’s certainly worth overdoing — they hung eggs from every available branch and draped ribbon everywhere they possibly could. 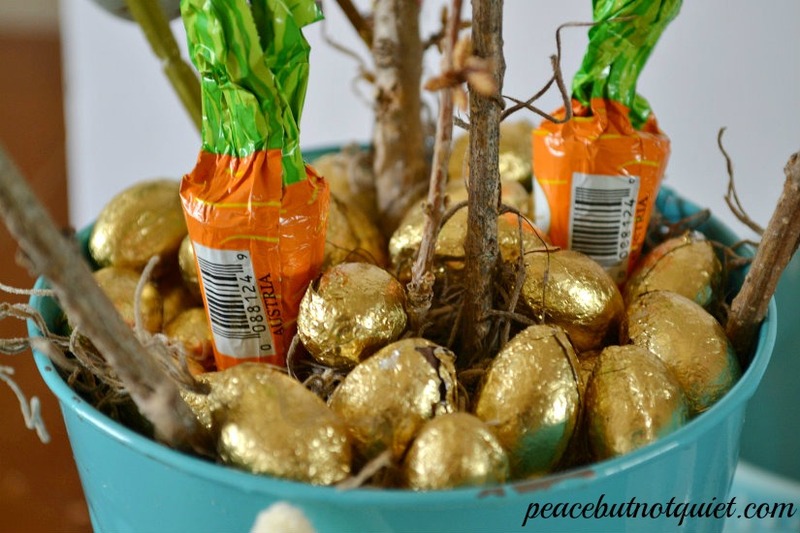 I think they were also secretly hoping that, with an Easter tree, perhaps the Easter bunny might feel obligated to leave a few presents under it, like Santa Claus. Hmph. 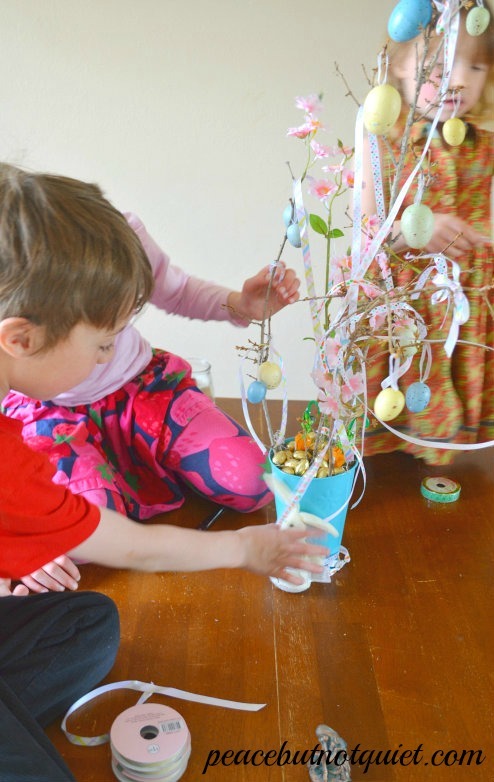 Around the bottom, we added some chocolate eggs and delicious chocolate carrots (everyone’s new favorite vegetable). 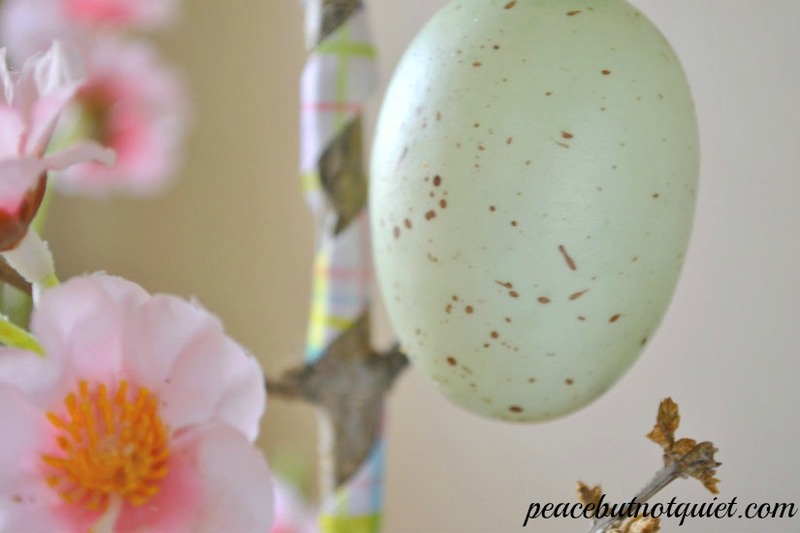 This might be my favorite new easy Easter craft to do with the kids. And judging from the amount of time they spent decorating, adjusting, and getting things arranged perfectly, I think it might be theirs as well! But then, the carrot napkin rings we made last week were pretty cute, too.